Featuring screenshots, remarks, and things Tom Emanski might have said, if Emanski liked to speak in advisory rhymes. To be honest I never watched those videos beyond the minute-long TV commercial. Raul properly approaches the ball, taking a good angle to make sure it wouldn’t get to the wall. 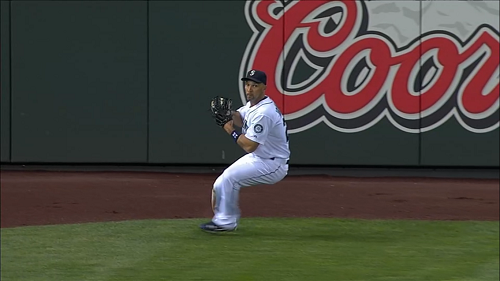 At the moment of contact, there was a runner on first, and Ibanez would’ve wanted to prevent him from scoring. 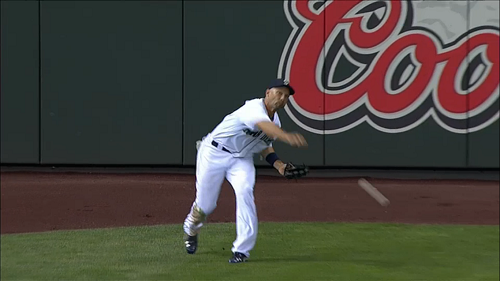 Failing that, maybe Ibanez could keep the hitter to a single. Run the right line, you’re doing just fine. Raul backhands the ball, successfully cutting it off. He’s low to the ground and in good position to get his feet set and throw. Cut the ball off and the watchers won’t scoff. 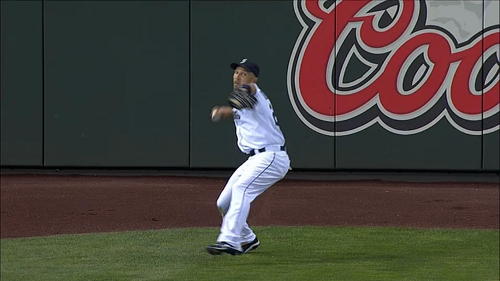 Right away, Raul gets himself into good throwing position. He’s stopped his forward momentum, and he’s turned to face the infield, with his feet locked and his free hand retrieving the baseball. With smooth stopping and turning, your knees won’t be burning. Raul looks like a pitcher, with his glove arm extended, his front foot in the air, and his back leg bent. He’s channeling momentum in a line toward an infielder, and he has his eyes on the target. To make a good throw, you need to have mo’. Raul prepares to release, with his glove over his front knee and his back foot shifting forward. His eyes are still locked, and though his left foot is closed, pointing inward, we’ve seen pitchers like Ian Snell get by despite this. Still, it’s a troubling indicator in an otherwise picture-perfect screengrab. With feet closed at release, success will decrease. Raul forgets to let go of the baseball at the right moment during his throwing motion, instead spiking it into the ground nearby. This is pretty much nothing short of a humiliating catastrophe, and it’s not the first time Raul has done this, and everybody is watching, and these are the moments in which you’re thankful Raul still gets to play the outfield despite all the evidence suggesting declaring such strategy is a mistake. Raul basically had it all down except for the last bit where you let the baseball go, i.e. throw it. This played out as if there were a throwing-motion sequel to QWOP. If you forget to let go, your throw’s gonna blow. 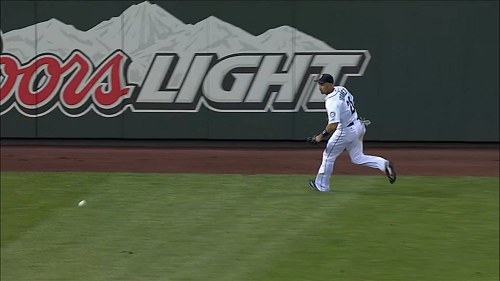 A different outfielder jogs to retrieve Raul’s throw attempt, which crash-landed shortly after takeoff. In this sequence, Raul treated the center fielder like a cut-off man, and then he missed him. A thrower to center’s a problem inventor. Raul temporarily takes no pride in his defense. When your throw isn’t aces, be sure to make faces. Raul with a ridiculous number of dingers was actually starting to be fun. Raul without all the dingers is just the player we were afraid he would be when he was signed. Not so fun. Although I have to admit that I burst out laughing at this play when it happened. Still, you don’t want too much of that kind of fun. Nine out of ten, would read again. When you’re bad at defending, happy won’t be your ending. I made fun of this throw as well, but I feel obligated to point out that Raul’s constant presence in left field isn’t his fault – it’s the fault of Zduriencik’s roster construction, which has then been aided and abetted by the baseball management wizardry of Eric Wedge and Robbie Thompson. When your outfield is crap, many GIFs will we snap. 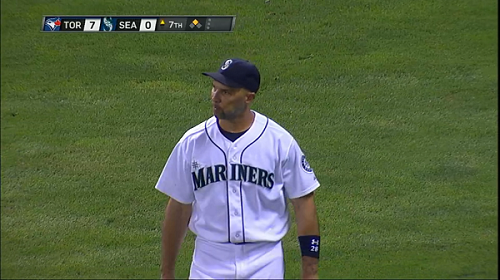 I’m glad Ibanez gets steady playing time in the outfield. Solely for entertainment purposes. Building your team around dingers will land you some defensive stingers. 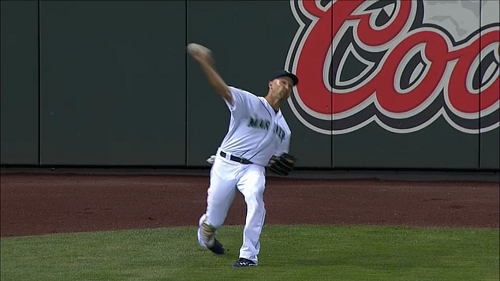 Raul throws from left field like Carly Rae Jepsen throws out the first pitch. I was gonna point out that your line doesn’t rhyme, but then I realized you weren’t actually playing the game of the other posters. 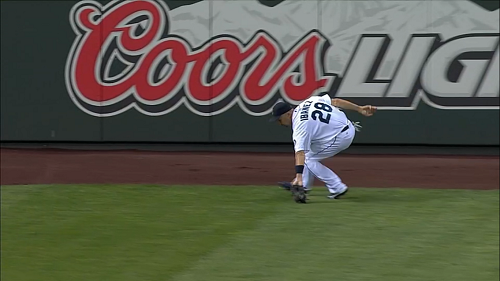 When the throw you halt, say it’s the infielder’s fault. If we are to believe the News Tribune version, Raul must be legally blind and it took time for Franklin’s abandoning second base to register. He clearly has his eyes locked in on the target up to the point of release. Even if Franklin had moved, Raul could have bounced his throw in Franklin’s direction. For whatever reason, the ball stuck to Raul’s fingers and did not release as planned. Raul has also made some strong, accurate throws so it is not all bad. The lengths people go to defend Ibanez are stunning. Thompson blaming Franklin for that throw? Those fault was it when he couldn’t figure out which arm was his left and which was his right? Probably Miller’s. Sims was pushing that narrative during today’s game too; blaming Franklin. Awesome, Raul made MSN for that! Throw lawn darts like Raul, look like a tool. If Raul throws like pus, toss a rookie under the bus. When Raul makes bad throws, USS Mariner can stop talking about how much Ackley blows. Oh that’s right, I forgot, anyone who reads USSMariner is automatically smarter than the manager, or interim manager, as the case may be. I certainly don’t think playing Raul in the outfield everyday is ideal, but to write an entire piece on this throw without including the official story is not “the grad school way” of saying anything. Grad school students, at least those with competent advisors, take the time to cite relevant sources and provide meaningful critique of the ones that they disagree with. They aren’t allowed to ignore accepted authorities in the field just because it’s their blog and they can do what they want with it, and they don’t leave things out just because they can’t think of a clever rhyme. Probably because the official story is a joke, goat. Look at pictures 3, 4, and 5 goat. Then explain how Raul couldn’t see where Franklin – or any other infielder, for that matter – was located, given that he’s looking in the whole time. 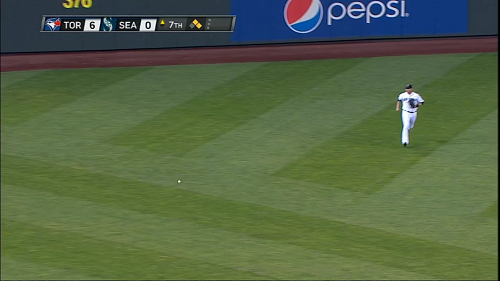 Raul has made this same lawn dart throw before. He did it last fall during the playoff chase. Franklin was obviously in the crowd in 2008, thus absolving Raul of any blame. ML baseball player, better at baseball than nearly all other baseball players on the planet, except when he really is not. Some people seem to be back to being overly defensive about Raul now that he’s not hitting again. If you throw the ball into the ground, it’s your fault. At absolutel best, seems to me it’s a complete failure to double clutch after realizing your c/o man is out of position (something that should probably cause you to adjust your throw, not stop it).